Online gambling operator LeoVegas is to pay £627,000 for misleading ads and not protecting vulnerable customers, the Gambling Commission has said. LeoVegas did not "take all reasonable steps" to stop problem gamblers who had asked to be banned from its websites, the watchdog said. The move comes after the Gambling Commission imposed a £1m penalty on Sky Bet in March for a similar breach. The watchdog vowed to be "tough" with those who failed to meet standards. The Gambling Commission said LeoVegas had failed to return funds to 11,205 customers who had "self-excluded" - that is, asked betting firms to refuse their service. 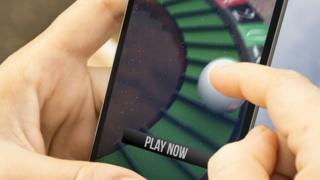 It had also sent marketing material to 1,894 people who had previously self-excluded, as well as allowing 413 previously self-excluded customers to gamble again without talking to them first. In addition, it was responsible for 41 misleading website advertisements that were unclear or omitted significant information about its promotional offers. The commission said LeoVegas had acknowledged the breaches and had made changes to address the problems. In results published on Wednesday, Sweden-listed LeoVegas said its first-quarter revenues had risen by 76% to €77.4m (£68.2m).